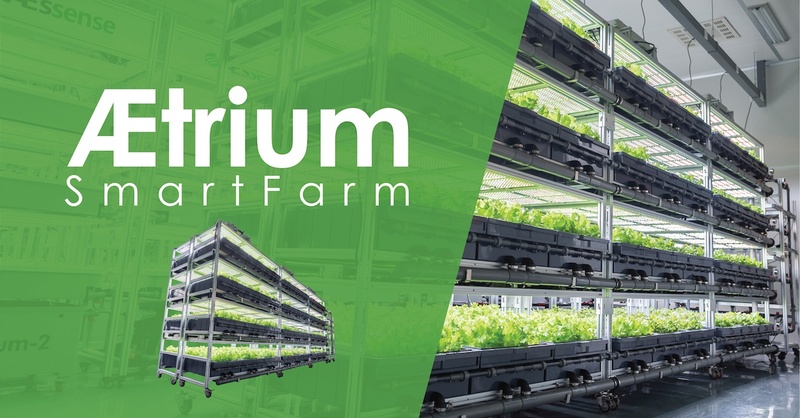 The AEtrium-SmartFarm is the latest in the AEssenseGrows portfolio. This stacked 4 layer automated grow system was created with modularity and high volume commercial farms in mind. These farms produce 30-40 pounds of highest quality delicious produce per square foot per year. The SmartFarm is highly flexible and can execute the grow plan for any recipe in the AEssenseGrows Fresh Produce Catalog. The SmartFarm produces 30-50 times more produce per square foot when compared to field crop production in soil. Grow recipes are deployed to any automated sensing and dynamic dosing unit on-demand to reproduce exactly the same grow plan with tireless precision and perfect predictable results. The SmartFarm is highly automated. 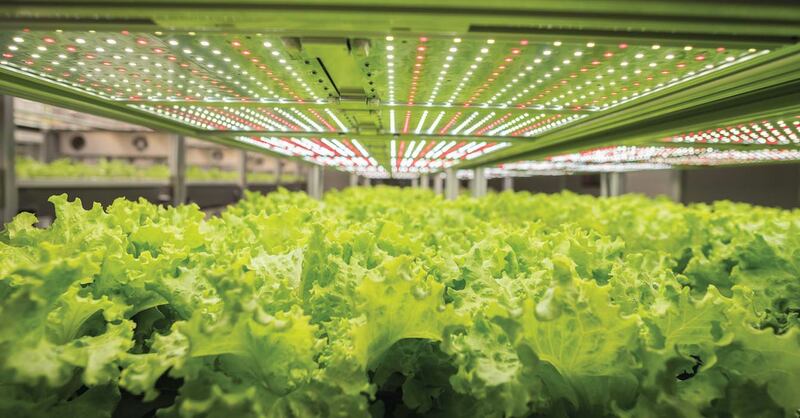 Each layer includes its own power and energy efficient, cool-running LED light panels, full coverage irrigation, sensor monitoring, and wireless notifications. Every dynamic dosing unit can be interrogated for sensor readings, activity, grow plan, etc. Any recipe can be loaded to produce the desired variety on an individual basis. All sensor and environmental tracking can be backed up to the Amazon cloud (AWS). 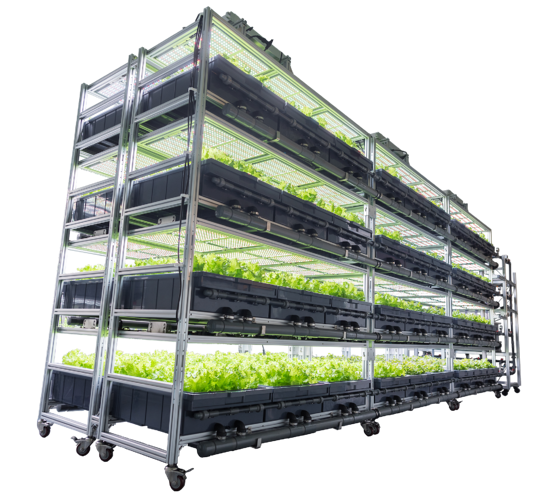 The SmartFarm offers easy access with minimal maintenance. Configurable in 24, 48 or 72 tray versions, the layers are adjustable for plant height ranging from 9-12 inches (23-30cm). 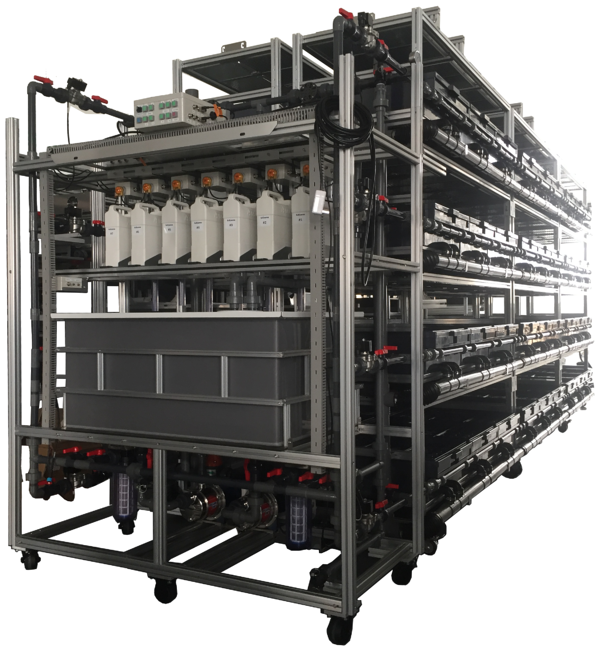 The nutrient dosing controls are positioned at one end of the stacked towers for easy access for refill needs. The SmartFarm is a complete system. The lighting panels provide full spectrum white PPFD intensity levels greater than 300 umols/m2/s and are 0-100% dimmable. Guardian™ Grow Manager software offers remote access and control of lighting, nutrient grow recipes, irrigation schedules, environmental monitoring & control, operator task managment, and many more features from any keyboard or smart phone.